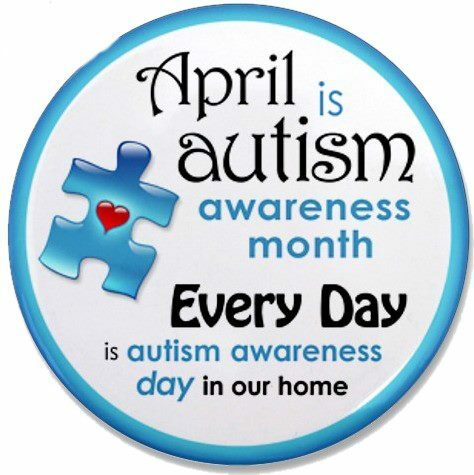 As as the month of April comes to a close I wanted to share some really beautiful autism awareness videos that have been made this month by a few of my blogger and Facebook “friends”. Parents with children on the autism spectrum know that autism awareness doesn’t just happen for one month out of the year. It’s something that we do DAILY! 24/7/365! Some days it’s easy…but many more days it’s just damn hard! I know these videos that I share will help to carry me through those rough days and I hope it will help to remind others that these are the faces of our beautiful children on the autism spectrum and they are worth fighting for every day, all year long! Help us spread autism awareness, understanding, and acceptance! Please take a little time to watch these wonderful videos and also check out these moms’ blogs/ Facebook pages! I was doing my weekly grocery shopping. Minding my own business. I also happened to be kid-free and was enjoying the moment. I was strolling through the produce department where I came upon the potato bins. Do I individually pick out some small red potatoes or just get the more economical 5 pound bag? I very rarely get the big bags because we just don’t usually go through that many potatoes. Innocent questions running through my head. This caught me so off-guard. To see Autism Awareness being spread through POTATOES! It took everything I had in me to keep myself from sobbing. There I stood. In front of the potato bins. Tears welling up and spilling over down my cheeks. I was so moved that an entire food brand would champion our cause! Of course, I grabbed a bag and tried to somewhat collect myself. I still had the rest of my grocery shopping to do. Later at home I had to go check out the Klondike Brands website and found that they had a link to a very cute online story! 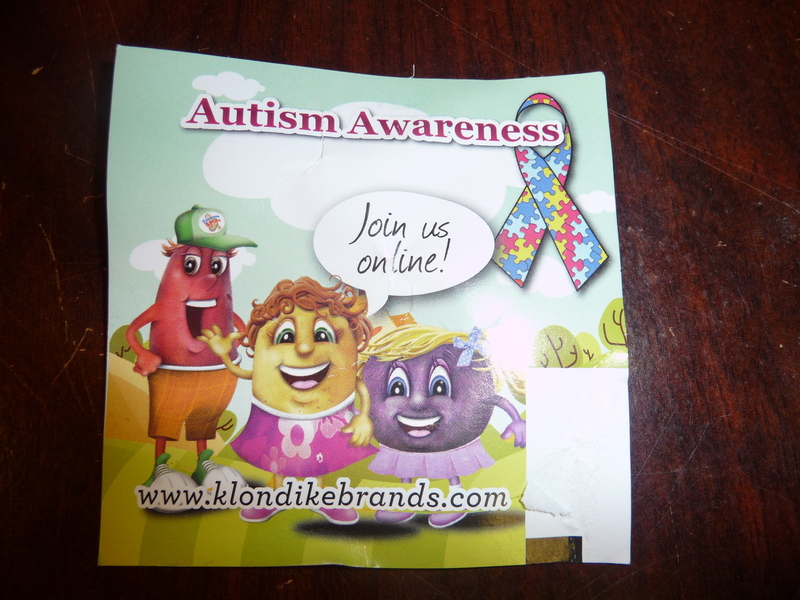 Thank you to Klondike Brands and the Autism Society for working to spread autism awareness one bag of potatoes at a time! I would have never expected potatoes to move me to tears! ~But first, I must give full credit to Mom-NOS for sharing her concept and presentation of a hairdryer kid in a toaster-brained world. Thank you so very much for sharing your brilliance! Truly! ~Also, thanks again to Caffeinated Autism Mom for her help in giving me some pared-down direction to make a presentation of my own using these ideas . Here’s Teaching Moment #1 just in case you missed that. Another exercise in how they are different and what things they might have in common. 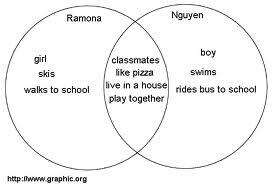 She gave them prompts: “draw your favorite food in your part of the circle” and then “ask your partner what their favorite food is and draw that in their side of the circle”, etc. After they had each drawn three small pictures of things that were different about them, they concentrated on the center over-lap, finding two things that they both liked. After some discussion about their diagrams it was my turn. I started by reviewing just a little bit about what we talked about my first visit to the classroom, the book My Friend Has Autism, and the brain hats they made. I told them about how April is Autism Awareness month and about how some people might be putting blue lights on at their house to remind people about autism. Some of them seemed to think this was pretty cool! Then I told them it was time for pretend. We were going to pretend that our brains were made up of wires and metal and plastic which got a few giggles from them. Then I said, “Now, what if all these parts of wires and metal and plastic all got together and grew into a….toaster!? 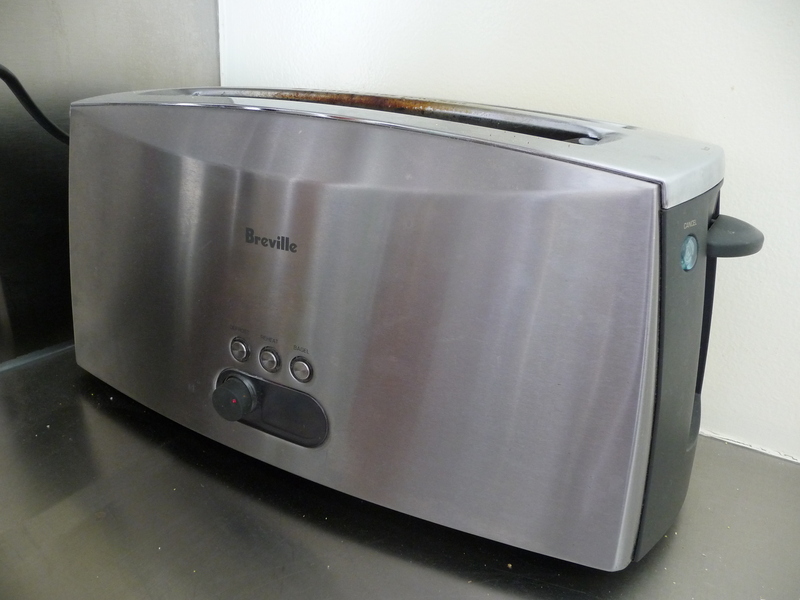 !” As I said this I reached into my bag and brought out our toaster. This got a lot of laughs. “Hey! That’s from our kitchen!” Henry said. Which brought on even more laughter. “Make toast!” many of them said. Excellent. 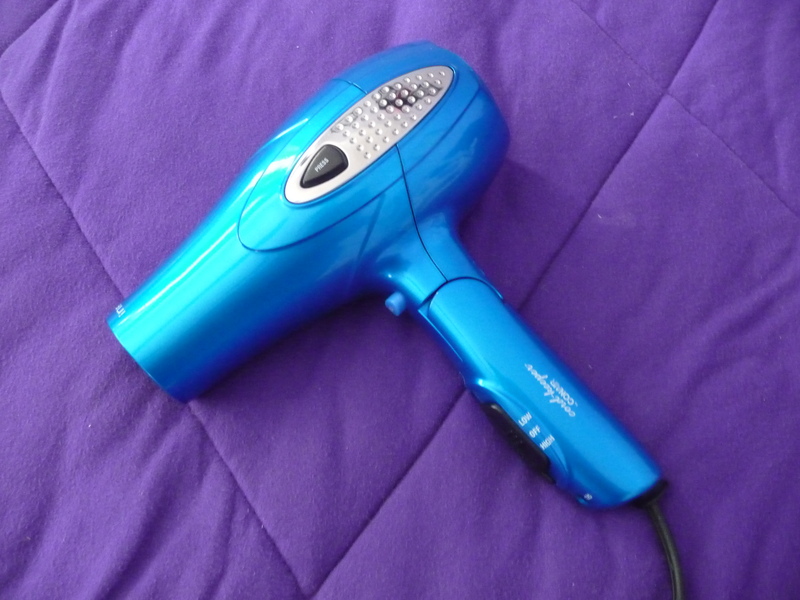 Then I moved on to talk about, “Now what if MY wires and metal and plastic grew into a hairdryer?” And I reached in to my bag and brought out a hairdryer. We talked about how even though toasters and hairdryers were made up of similar things, they were very good at different jobs. “No.” was the most common answer. 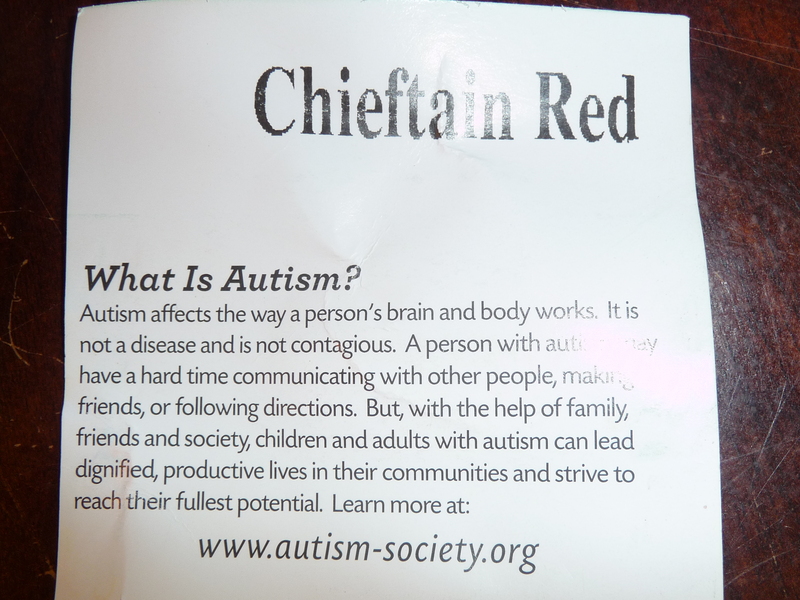 By this point I could see that I was losing a few of the kids’ attention so it was time to hand out a coloring page that I had printed out of an awareness ribbon made of puzzle pieces that the kids could color. We put a colored picture of the Autism Awareness Ribbon up on the board and we talk just a little about the ribbon and about April being Autism Awareness month and I reminded them watch for houses with blue lights. And then it was time for me to go. Whew!